This is exactly what some flood victims in Koppal district resorted to once they were distributed compensation for partially damaged houses—not because it was plenty, but too paltry to be put to good use. In the worst-hit Hachcholli of Bellary district, many poor people hit arrack shops or gambled away the relief fund. Paradoxically, amid its ruins stands a wine shop—all intact. When I visited some flood-hit villages perching perilously on the rain-swollen Tungabhadra and Hagari riverbanks, I came close to understanding why these men took refuge in such acts with impunity. Their mud houses couldn’t have withstood even a fairly heavy rain, forget the pounding that went on from September 30 to October 2. The mud melted, the wooden posts collapsed and the houses caved in. All this happened when the people were hobbling along with their children and old parents to the other edge of their small world. Karnataka Government sources say that 22 villages (5,611 families) in Koppal district and 20 villages (6,800 families) in Bellary district have been marked out for relocation. In all the six villages I visited (Hachcholli, Halegondabalu, Kakkaragol, Hiresindhogi, Kudadaral and Shridharagadde) across Koppal and Bellary districts in the second week of November, one thread stood out persistently from among a string of grievances raised by the victims: They complained that the survey conducted days after the tragedy was biased and slipshod. Both local- and taluk-level officials did not even bother to enter and take a look into the so-called partially damaged houses. Sometimes whimsical, often deliberate, they scribbled a number on the cheque cavalierly and handed it over to the victims. The rich got a better deal, whereas the poor feel that the bureaucrats’ chilling disregard is rooted in the inherent prejudice that those who live in huts and on the fringes do not deserve anything better. Lokesh admits that the local officials sat down in temples or gram panchayat offices or in some prominent persons’ houses and fixed the relief amount. In all, 1,167 houses were given cheques in Hiresindhogi. We halted that survey and conducted a new one to rectify the mistakes. The state government entrusted village accountants and secretaries with the task of damage assessment. Questioning the futility of such methodology, Basavaraj Kowtal, convenor of Human Rights Front for Dalit Liberation-Karnataka, says: What’s the purpose of these repeated surveys when there is no engineer or expert to assess the damage? How can a village accountant or a secretary be entrusted with this job? Professor T R Chandrashekhar of Hampi Kannada University, who led a seven-member team of scholars and research assistants to study the nature and consequences of floods, says he noticed a great deal of uncertainty with regard to resettlement and “nobody knows how it will end”. He regrets that all the operations are being carried out without consulting the people. On the contrary, Siruguppa tahsildar Geetha N R claims that people pulled down their own houses to get full compensation. Kowtal dismisses this statement and calls its nonsense. Ironically, claiming “swift relief action and massive reconstruction” in its “Report to People-1 – Unprecedented Floods” dated December 6, the Karnataka government says that 6.55 lakh houses have been wiped out but makes no mention of the partially damaged houses. 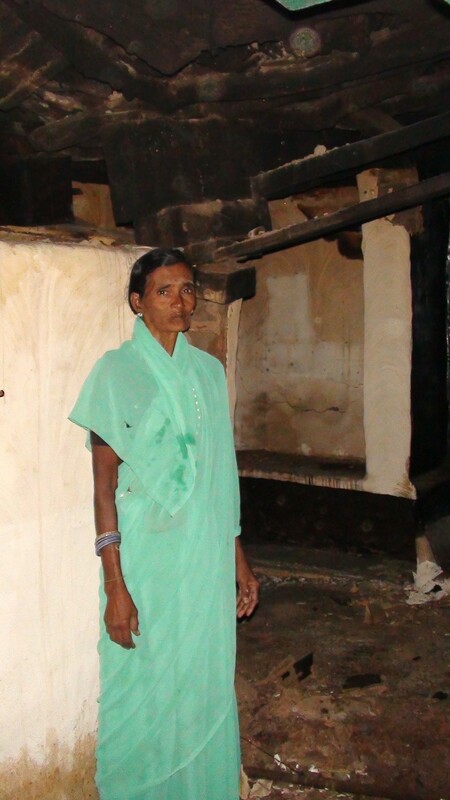 Neelamma, 80, keeps a watch on monkeys and strays in front of her damaged house in Kakkaragol of Koppal district. Is the damage partial or the bureaucracy? Expertise to assess the damage is important, but in fact, it needs a casual glance to comprehend the sordid state of affairs. In some kachcha houses, either the roof has come crashing down or the façade or the walls. 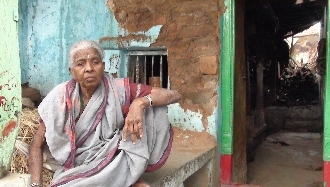 In front of these unlivable houses, old women keeping a watch on strays and monkeys was a common sight in Kakkaragol of Koppal, a village which was preparing for the chief minister’s visit. In the meantime, most of the RCC buildings—generally very few and owned by well-to-do families—have withstood the floods and are at least in liveable conditions. Kowtal isn’t at all ready to buy into this theory of partial damage. 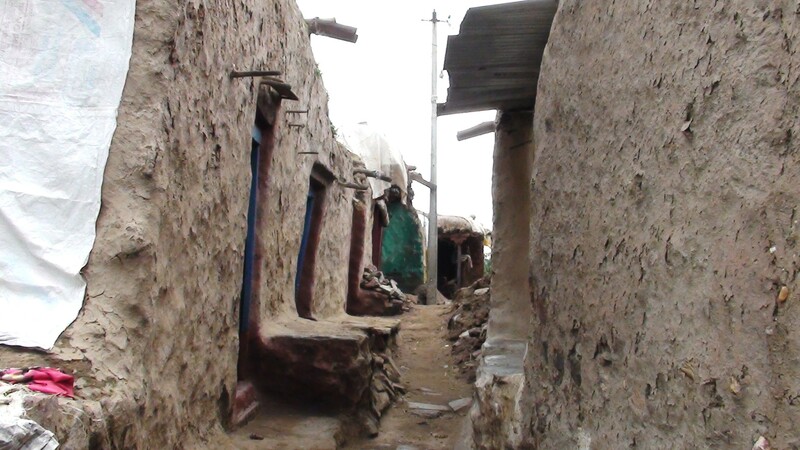 These mud houses are extremely fragile because most of them do not have a sound foundation. The walls may be standing upright now but one rain is enough to bring them down. The entire structure needs to be razed and rebuilt all over again. Even for temporary repairs, 35,000 rupees is not enough. Amidst ruins and tears: Sarojamma, Hiresindhogi. After consulting some victims in Bijapur district and engineers, HRFDL submitted a memorandum to the Legal Services Authority in the Karnataka High Court in the last week of November. 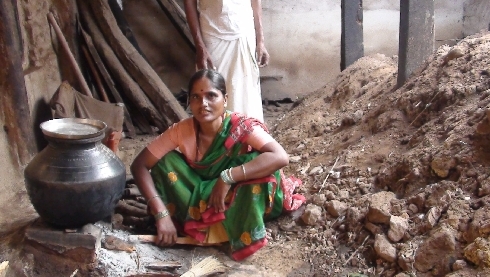 They estimate the cost of building a decent mud house at Rs 1.5 lakh. “If not, we have demanded that the government should give a minimum of Rs.80,000 for repair works,” adds Kowtal. 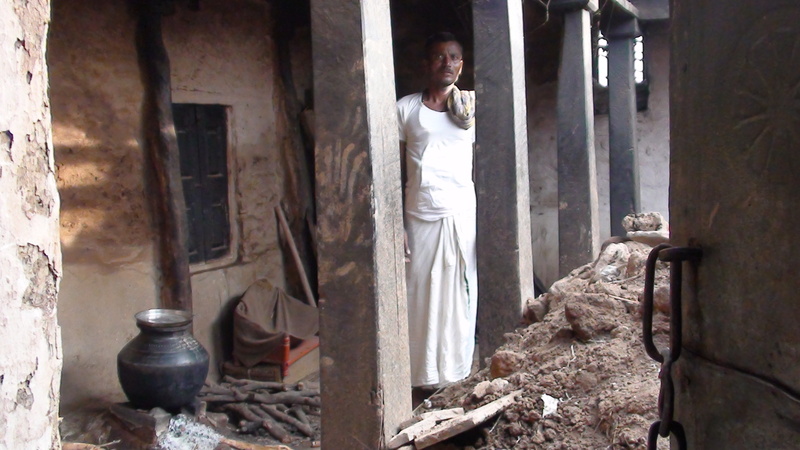 In one such house in Hiresindhogi, I saw a huge heap of mud and broken wooden posts lay right next to the fireplace. While various kinds of creepers meandered all over the damaged roof, a swarm of butterflies were fluttering merrily over the bright yellow flowers. Ironically, none of these flowers or butterflies stood in tribute to the past. Everything that was so familiar had turned so hostile! Unless one is forced to live under these circumstances, it is difficult to fathom what it means to be homeless. Partially homeless, that is. Behind her frail appearance lies an irreducible faith in divinity and a stubbornness that no floods can wash away. Nor can the officials, smug as they may be in their reprehensible deeds, dent her grace. Can a few biscuits trigger a riot? This entry was posted in 2009 North Karnataka floods, Candid Comments, Free Flowing, Women's Issues and tagged 2009 North Karnataka floods, disaster relief by Yeddyurappa govt, Hachcholli, Halegondabalu, Hiresindhogi, Kakkaragol, Karnataka Government resort politics, Koppal and Bellary districts, Kudadaral and Shridharagadde, Shimoga district rains, Tungabhadra. Bookmark the permalink.